& Mold Removal ExpertsContact Us Today! Here at Home Environment Solutions, we believe that all homeowners are entitled to the benefits of an energy-efficient, healthy home - and we're here to make that a reality. With over 25 years in the home restoration industry, our staff has been around houses long enough to truly understand effective home performance. As a member of the Dr. Energy Saver network, we can utilize the highest-quality materials combined with up-to-date education to achieve our goals. We hope to share these services with as many homeowners as possible and keep all families safe and happy at home. All of our technicians are fully trained and certified to carry out work needed. Customer satisfaction is our top priority! We have the expertise to solve your home performance issues, no matter how complex they might seem. Call us today at 1-740-266-8000 or contact us online to get started with a free estimate in Cecil, Saint Clairsville, South Park Township and the nearby areas. Isulation job beyond expectations, done on short notice, excellent crew. If you're experiencing drafty rooms or soaring energy bills, chances are your home lacks sufficient insulation. Proper insulation is the best way to protect your indoor environment from the air outside, keeping energy efficiency high and costs low. We work with a variety of high-quality materials to effectively install insulation in any room in your home. Additionally, we offer air sealing and weatherization services to further boost your home's performance. Let us help you take back control of your environment! In addition to insulation, we also offer mold removal services. Mold is dangerous not only to the integrity of your home's structure, but also to the health and safety of your family. Our certified technicians will diagnose the extent of the problem and inform you about the best course of action. Owner Carol D of Brackenridge, PA was looking for a solution to reduce the road noise from the high traffic street in front of her home. Carol was also concerned about losing storage space in her knee wall attic. Mark O. proposed insulating the attic with sound reducing TruSoft cellulose insulation and insulating the knee wall with Cotton Armor insulation batts. Foreman Mike Y. and his team Craig C. and Zach T. air sealed and insulated the attic to R60. In the knee wall attic the team removed the 60 year old paper insulation and replaced it with Cotton Armor insulation held in place with insulweb. The owner said she can’t believe what a difference it’s made both with the comfort of the bedroom and the sound. If you own a Cape Cod home its likely that you are experiencing extreme temperature differences from your down stairs to your upstairs. At Home Environment Solutions we know why you are experiencing these temperature differences and we have your solution to the problem. Cape Cod homes are built with Knee Walls upstairs which can be tricky to insulate. If not insulated correctly these areas become gaping air leaks causing havoc on the heating and cooling of your house. Call us today for a free home evaluation. High energy bills and a need for clean storage lead this Bethel Park, PA customer to Home Environment Solutions. After doing a free full home energy audit, HES discovered insufficient and deteriorating fiberglass insulation in the attic. 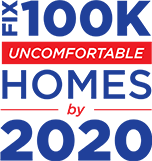 This is no surprise, the North American Insulation Manufacturer Association (NAIMA) says that 90% of all single family homes are under insulated. HES cleaned out the old deteriorating insulation, air sealed, and insulated using Tru-Soft Cellulose Insulation. Particle board was used to dam the insulation and create clean storage for this customer. Not only can the customer store all of their belongings safely, but they will be saving on their energy bills, too! Let us help you improve your home's performance today! Although upgrading your home's insulation might seem like a lot to take on, waiting will only compound your issues in the long run and cost you much more. Let the reliable contractors at Home Environment Solutions restore your home and improve its efficiency and comfort for years to come. Home Environment Solutions is a local, family owned and operated company with decades of experience in home renovation and customer care. 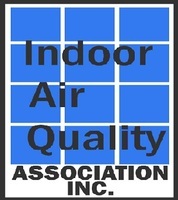 Call us today to get a free estimate on all our insulation and mold remediation services. 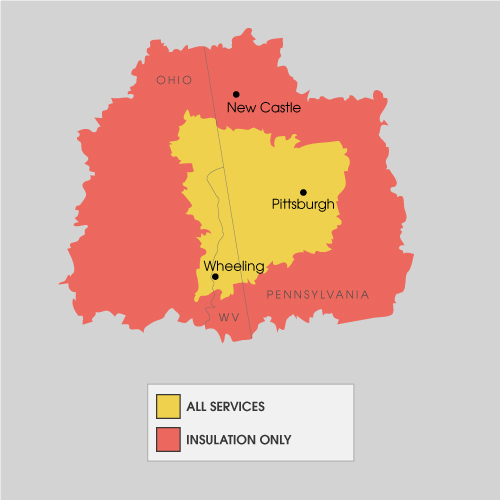 We proudly serve in Cecil, Saint Clairsville, South Park Township, Venetia, Cadiz, Washington, Steubenville, Wheeling, Weirton, Canonsburg and throughout the surrounding areas.